The Nelson Mandela and the African Renaissance Lecture is in honour of the legacy of the first black president of South Africa and leader of the people’s liberation movement, the African National Congress, whose centenary we are celebrating in 2018. This lecture is dedicated to Nelson Mandela’s exemplary life and commitment to the African continents freedom and unity. The lecture is an ode to the Summit theme, to encourage collaboration and unity amongst Africans, ideals that President Nelson Mandela inspired through his leadership and life, principles that His Excellency Thabo Mbeki continues to embody and advocate for in his call for an African Renaissance. The aim of the school visit is to engage, interact with and motivate young people in public schools. Delegates will be expected to speak about their work, and their countries to promote active citizenry and entrepreneurship. These presentations will also feature a Question and Answer session as well as a book presentation to the school’s library that will see young African Leaders donate African literature by authors from their respective countries to the young students. The Cradle of Humankind World Heritage Site and Dinokeng are initiatives of the Gauteng Provincial Government to establish geo-spatial tourism destinations in the north-west and the north-east of the province, close to the densely populated metropolitan areas of Johannesburg, Tshwane and Ekurhuleni. The Cradle of Humankind is one of the eight World Heritage Sites in South Africa, and the only one in Gauteng. It is widely recognised as the place from which all of humankind originated. Delegates will experience the views and sites of the city of Gold on a tour that focuses on some of Joburg’s most beautiful buildings, public art, history and regeneration. Focus: Policy Regulation – Enabling or Disabling Youth Entrepreneurship? 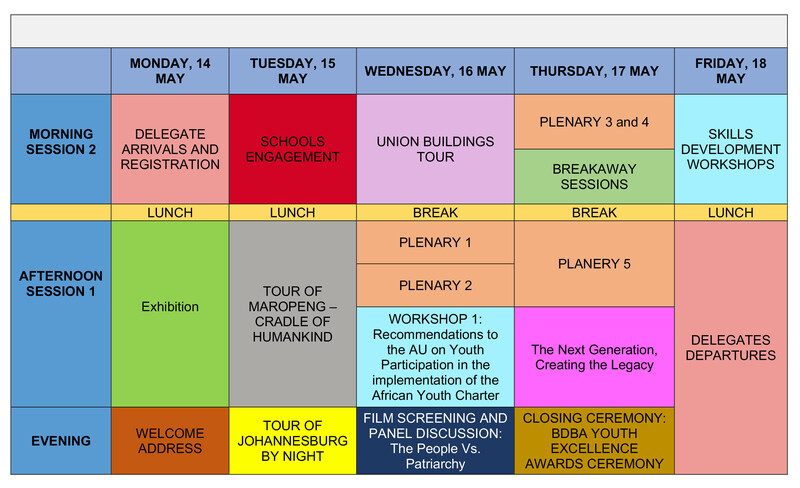 The BDBA Youth Summit workshops are intended to engage, teach or introduce delegates to practical skills, techniques, or ideas that will improve their business or approach to leadership in their area of interest.